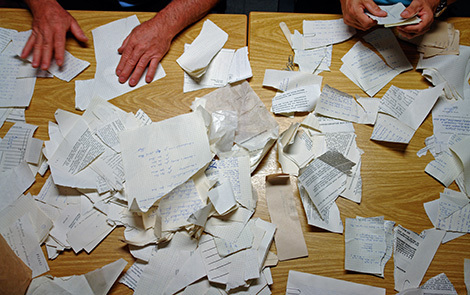 At the beginning of the 1990s the Stasi Records Archive began reassembling documents which had been torn up by hand by the staff of the Ministry for State Security (MfS). This material had been stuffed into a total of 16,000 bags. 1.5 million pages from 500 bags have been manually reconstructed, indexed and archived. In 2007 research began on developing a computer-aided reconstruction program in a pilot project. Since the launch of the test phase at the end of 2013, approximately 60,000 pages from 18 bags have been reconstructed so far (status August 2016). Why are there torn up Stasi documents? During the Peaceful Revolution in 1989/90 numerous documents of the Ministry for State Security (MfS) were destroyed by its own staff. They were executing destruction orders designed to erase any traces of unlawful actions and information about people’s identities. But they also got rid of everyday records of the Ministry. Documents were shredded, pulped or burnt. Many documents were first torn up by hand and stuffed into bags awaiting final destruction. The occupation of the Stasi offices by citizens, which began in December 1989, gradually put a stop to this destruction. How much material was destroyed? Following the issuing of the order for the destruction of material and its execution by the Stasi itself in the autumn of 1989, there were further incidents of destruction of Stasi documents in the first half of 1990. These were approved by political bodies in the GDR (Round Table and interim government) albeit not without resistance and pressure. They include, for instance, the destruction of records of the HV A (Main Directorate Intelligence of the MfS) or of the sub-division military espionage of the NVA (National People’s Army) whose early documents had been stored in the Stasi archives. In contrast, the destruction of the card indexes of the HA VI (Main Directorate for Passport Control) with details of entry into and departure from the GDR was in keeping with generally accepted data protection regulations. The exact volume of material destroyed by the Stasi in 1989/90 could not be accurately calculated up to now. A BStU research product is currently examining all existing sources in order to make a more accurate assessment. How large is the volume of material torn up by hand? The Stasi left behind material, which had been torn up by hand, but which could still be processed in approximately 16,000 bags. Each bag contains between 2,500 and 3,500 fragments of torn-up pages. There are still roughly 400 to 600 million fragments which represent around 40 to 55 million pages. Could shredded paper be reconstructed? No. A few thousand other bags contained paper that had been shredded into incredibly small pieces in 1990. This material was destroyed back in 1991 after inspection by the BStU. Hence, there is no longer any paper shredded by the Stasi at the BStU. What’s the point of reconstructing documents? The Stasi Records Act stipulates that the BStU is responsible for the storage and safekeeping of the documents in the archive and making them available for access. The key priority is to give people who were persecuted by the Stasi access to the data collected about them but also, more generally, to facilitate reappraisal of the past on the basis of these files. These files also include torn-up documents. Their reconstruction is part of the BStU’s official mandate. Do we know what the bags contain? In a first inventory the bags were recorded and inspected in 1991/92 and the results of this initial evaluation at the Berlin HQ have been documented in the First Activity Report. Since 2008 further bags have undergone successive close inspection which means they were initially sorted in line with formal criteria (registration numbers, file numbers or paginations). Then they were examined for their relevance in terms of content (topics or references to individual people). The last step was to record the degree of destruction. Up to now, 3,300 bags have been inspected more closely. The results are used for the further selection of bags for reconstruction. How are bags selected for reconstruction? Importance of the service unit. When it comes to reappraising the activities of the MfS in conjunction with victims, the units of the "operative division", i.e. persecution, surveillance and "subversion" of individuals and institutions, are particularly relevant. The principle of filling in the gaps, i.e. consideration of torn-up material from service units for which few intact records have survived. Regional history of the MfS. As more than half of all the torn-up documents come from the former district administrations of the MfS, regional topics should be taken into account. How is manual reconstruction done? In 1995 the work on torn-up documents was centralised in the Manual Reconstruction project group. Documents that have been torn in half or into quarters are spread out, and the fragments pieced together like a large puzzle. Once they have been matched, they are glued together. The reconstructed pages are then recorded by the archivists at the BStU and indexed in the archives. The staff for the time-consuming puzzle work was mainly recruited in the mid-1990s through co-operation with the Federal Office for Migration and Refugees (BAMF) in Zirndorf (Bavaria). In response to the current situation, the BStU made available the four recently seconded employees of the Federal Office as well as four of BStU’s own temporary employees to the BAMF from the beginning of 2016. Since then manual reconstruction work has been ongoing at the headquarters in Berlin and in the regional office in Frankfurt (Oder). When did virtual reconstruction begin? The pilot project for virtual reconstruction was launched in 2007. A feasibility study in the years prior to that identified the necessary prerequisites. The German Bundestag approved funds for the development and testing of a completely new technology. The BStU awarded a research contract to the Fraunhofer Institute for Productions Systems and Design Technology (IPK) with its head office in Berlin-Charlottenburg. In 2011 the German Bundestag made additional funds available to examine the opportunities for the IT-aided indexing of large volumes of documents in the archives. How is the virtual reconstruction project financed? The German Bundestag approved one-off funding for the pilot project of EUR 6.3 million. This sum was intended to cover the entire development phase and the test phase involving the reconstruction of fragments from precisely 400 bags. The plans envisaged eight "milestones" in the pilot project, each with its assigned remuneration. With its approval of the seventh milestone at the end of 2013, the BStU has confirmed that the new software works. At the same time, in the course of 2014 the project was halted by the Fraunhofer IPK as it had become clear that the objective of the original project plan, i.e. the complete reconstruction of 400 bags, was not possible with the existing technology. Up to this point in time fragments from 23 bags had been scanned and they had all been virtually reconstructed. Manual reconstruction of Stasi documents. How does virtual reconstruction work? The fragments are removed from bags at the BStU and the material is sorted on the basis of paper colour, photos and typeface into archivable boxes. Raster code stickers are placed on the boxes which contain information on the location and layering in the original bag. At the Fraunhofer IPK every box is emptied and a scanner makes high-resolution images of each fragment. The image data are stored with the raster code information, the metadata on the fragment. In the third step the puzzle software, the "e-Puzzler", then gets to work on the digitalised data. Using an algorithm it compiles the digital information based on the formal parameters of the fragment like colour, torn edges or typeface but also the metadata from the raster codes. It then depicts this information as a reconstructed page. During the ensuing quality assurance, BStU archivists check on the computer screen whether the software has got the puzzle right, whether the page has been correctly reassembled and whether it is legible. If the software is not sure, the human behind the screen decides and then "feeds" the learning algorithm. Up to now the proportion of puzzle pages correctly reconstructed by the software has been far smaller than the pages requiring assistance. The content of a reconstructed bag is handed over by the Fraunhofer IPK to the BStU on a data carrier and as a paper print-out. How can the documents be used? The restored documents are indexed by archivists at BStU and then compared with the existing inventory. During this work new file units are created from individual pages or existing file links are supplemented. Once they have been indexed the restored documents can be accessed by users with questions on specific topics. When inspecting a file, they can often be identified by the torn edges in the reconstructed pages. In the Finding Aids of the ARGUS database a search can be made for reconstructed documents using the search term "mReko". The material stems from all four decades of the GDR. Many of the documents were already helpful when it came to establishing what happened to people and for the rehabilitation of citizens. In manual reconstruction, for instance, documents could be restored about the spying on and persecution of prominent GDR opposition leaders like Jürgen Fuchs or Robert Havemann and the dissident writer Stefan Heym. The cooperation of various unofficial collaborators (IMs) with the MfS was confirmed in reconstructed files. The documents also provided insight into doping practice in sport in the GDR or border security in 1961. Some of the more prominent findings had to do with the RAF terrorist Silke Maier-Witt who went into hiding in the GDR. Up to now a large volume of contents from the late 1980s has been compiled in the virtually reconstructed pages. They include documents on the MfS plan of defence, on the investigations into a Nazi war criminal or on spying activities on the peace movements in the East and the West. They likewise include extensive files on the IM informer "Schäfer" who was active amongst dissidents in the 1980s. The comparison of reconstructed documents with the existing files in the Stasi archives also provides insight into the destructive methods used by the secret police in the autumn of 1989. How much has been reconstructed up to now? In the space of 20 years more than 1.5 million pages of Stasi records have been manually reconstructed. This is equivalent to material from around 500 bags. In the virtual reconstruction test process the content of 18 bags has been pieced together so far (status August 2016). This corresponds to approximately 60,000 pages. Does the virtual process work? In October 2013 the Fraunhofer IPK was able to successfully demonstrate to the BStU that the "e-Puzzler" works. However, during the overall process the scanning of fragments proved to be an obstacle. The scanner is not powerful enough to digitalise hundreds of thousands of fragments over a foreseeable period in an automated manner. The image processing of the scanner is not optimal either. After scanning the calculations have to be adjusted for shadow formation and lack of colour stability in a time-consuming procedure in order to achieve the desired results. This makes the process more difficult. Why is it taking so long to develop this process? The virtual reconstruction process has no model to go on and is unique in the world. It involves developing a technology from scratch. This process inevitably has included new findings prompting a new direction for the project design. The result has been a major rescheduling of the timeline and financial plans. In 2015 the Federal Audit Court (Bundesrechnungshof) began scrutinizing the continuation of the project and finished its examination in 2017, handing over valuable new impulses to the BStU for the continuation. By the end of 2017 the BStU decided on a new project design that was also approved by the advisory board to the BStU. The first project design had among its core goals to test the viability of a procedure on the basis of which a mass virtual construction of torn files could be accomplished. The pilot project served to find out that on the basis of current technology, the financial possibilities and in regards to economic efficiency this goal is currently not attainable. So the new project design aims to virtually reconstruct with a view to specific gaps in the archival records. This will be accomplished using the already tested software and an improved scanning technology. What is the situation with reconstruction now? Starting with the year 2019 the BStU established a staff unit in the Federal Commissioner’s office dealing with reconstruction. It is tasked with continuing the virtual reconstruction project and coordinating it with the manual reconstruction efforts in the archive department. Starting February 1 a team of around 10 archivists will work in the manual reconstruction at the Berlin site. In 2018 the BStU had the new project design by the Fraunhofer IPK intensely scrutinized by outside experts and tested its viability with a positive outcome. Currently BStU und Fraunhofer IPK are in talks to migrate the old project contract into a new project contract. The funding for a deployment of the enhanced scan technology in the amount of 2 million Euros was already provided in 2016 by the Deutsche Bundestag. The enhanced scan technology is able to more quickly and more precisely digitize the torn pieces.